Banff & Buchan MSP Stewart Stevenson has welcomed a response from Transport Minister Nicol Stephen that the Scottish Executive is considering further upgrading of the A90 between Peterhead and Aberdeen. 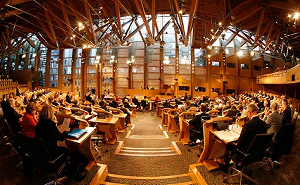 The news came in response to a Parliamentary Question tabled by Mr Stevenson on A90 improvements. “I met with the Transport Minister Nicol Stephen recently to discuss road safety improvements to the A90 south of Fraserburgh following recent tragic accidents on the road and the Minister undertook to study the accident reports carefully to see what improvements could be made. “Following our meeting, I also tabled questions on the A90 south of Peterhead and the Minister has now confirmed to me that an appraisal has been carried out on the single-carriageway stretch between Balmedie and Tipperty and the Scottish Executive is now considering its conclusions. “With no local rail link into Aberdeen, a good road network is essential to keep the local economy moving. Traffic snarl-ups on the road into Aberdeen place local businesses at a disadvantage at a time when we need every advantage we can get. Banff & Buchan representatives Stewart Stevenson MSP and Alex Salmond MP have announced the results of the survey of local Post Offices. The survey was launched at Fetterangus Post Office last month. The SNP representatives wrote directly to all postmasters in Banff & Buchan seeking their views on the current situation in an effort to provide as much support as possible for the rural Post Office network. “This has been a very worthwhile exercise and has unfortunately proved that some of my fears are well-founded. “For instance, over 90 per cent of those who responded felt that the future of their business is under threat from the Government’s move towards direct payment of pensions and benefits. Similar numbers did not feel that enough was being done to promote the new Post Office Card Account or, more importantly, that the application process was straightforward enough. “A large amount of Post Office income has, until now, come from processing benefit payments but more recently the Government has been encouraging claimants to have benefits paid directly to their bank accounts. The resulting decrease in income for Post Offices means that for many, their future viability could be in question. It is therefore is great concern that our survey has revealed that 68 per cent of respondents felt that the public did not know that they could use certain bank accounts at the Post Office. While individual responses will remain confidential, the overall results and comments will be sent to the Department for Work and Pensions and the Minister responsible for the Post Office as part of Mr Salmond and Mr Stevenson’s continued efforts on the issue.